1. Be kind/patient with yourself. Being a mom is hard. Most people focus on how you treat your baby (which, of course, is important!). But I think what is equally, if not more important, is how you treat yourself. Being a parent (especially a new parent) is really hard. And a lot of people don’t talk about that. When you announce to people that you are going to have a baby, most people talk about how wonderful and magical the process is. “You’ll love him/her more than you could have ever imagined possible!” “Babies are such a blessing!” While these statements may be true, those people conveniently leave out discussion of all the sleepless nights, possible post-partum depression/anxiety, huge messes, pain, challenges with feeding, crying (of baby and parents), and feelings of helplessness (of baby and parents). And then first time parents encounter these incredible challenges and think that something must be wrong with them that they are struggling so much with these things. No one ever mentioned all of the awful parts, so it must just be them. But guess what? THAT’S THE NORM! People just don’t talk about it! So, be patient with yourself. Parenting has a steep learning curve, and it is hard. And, as a society, we should definitely be talking about the hard stuff. 2. Babies are much more resilient than many new parents think. No matter how much of a “mom fail” you think you committed, your baby is more than likely okay. I think it is a universal statement that new parents worry about their babies. And many of them worry a lot. To be fair, there is a lot to worry about! When babies are born, not only are they defenseless and completely reliant on you for survival, but throw in illnesses, constant worry about SIDS (Sudden Infant Death Syndrome), lack of sleep, injuries…. It’s enough to make a parent sick with worry! But something I definitely learned through the process is how resilient babies are. As long as you are vigilant, trying the best you can, and learning from your mistakes as you go, your baby (and you!) will likely make it safely out the other side. 3. Every baby and every parent are different. When one of your friends tells you the “secret” they discovered to make parenting so much easier, it likely won’t work for you (and visa versa). Every person with a child will have opinions, anecdotes, home-remedies, and magical solutions for any problem you bring up. Your baby won’t sleep? “You need to sleep train.” “ You need to co-sleep.” “Try a long car ride.” “Feed them to sleep.” “Don’t feed them to sleep.” “Put them down drowsy but awake.” “Rock them to sleep.” “Dim lights.” “Pitch black.” “Sound machine.” “Complete silence.” The contradictions will be endless. And that is okay! They are just sharing what worked for them. But you (and they) need to know that what works for them likely won’t work for you. And may not even work for their next child. Just like we are all different, every baby and their needs/preferences vary greatly. 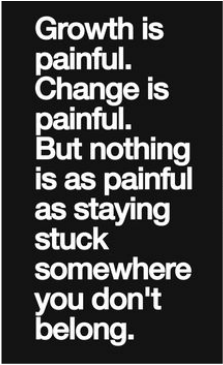 Just keep trying what feels like good fits for you until something works (and even then, know that just when something starts working, things will inevitably change). Learning to be flexible is a huge asset. This made a world of difference for me. Being a parent can be hugely isolating if you don’t have a “tribe”. I highly recommend joining some kind of mommy & me group, or other activity groups with your baby. When you are spending long hours every day talking to a little human who can’t communicate back to you, having some fellow companions who are also in the trenches makes a world of difference (even if most of your communication is through texts while cleaning up blow-out diapers or chasing a wild toddler around). 5. Practice lots of self-care, whatever that means for you. Happy you = better parent. This one is such a simple concept, but so important and often the first to fall by the wayside. I would also include in here that it is important to remember who you are as a person/spouse/employee/any other role you fill outside of being a parent. It is so easy to lose yourself in the role of a parent, but there are so many other facets of who you are that make you you! Don’t forget to nurture those parts of you. And in that vein, practice whatever self-care means for you. Whether that means working out, getting pampered, reading, hiking, bubble baths, watching some mindless television,… it doesn’t really matter what it is. Just make sure you make time to do them (and preferably without your children!). And of course, if you are struggling with any of these things (or anything else), do not hesitate to reach out for help. As I hope I articulated clearly above, PARENTING IS HARD! Knowing when you need to reach out for help is an incredible tool and will help make you a better parent (and happier person). Maintaining a strong bond with your romantic partner is very important, especially in a long term committed relationship. If you are in a committed romantic relationship, the stability of your family unit depends on the bond you have with your partner. The stronger your bond, the smoother your household will run, and the healthier your family will be. In the beginning of relationships, when you are initially attracted to your partner, you may have thought everything your partner did or said was the best thing ever! You may have wanted to be around them all the time or know every detail about their lives. As relationships go on this initial spark fades. Some of the things that you initially couldn't get enough of may now be annoying sometimes or there are specific things your partner does that may get under your skin. This is very normal! As time passes you may lose some fireworks but what you gain (hopefully) is a strong bond and shared experiences as you navigate through life together. Maintaining the bond with your partner is not a one time thing, it’s something that needs to continuously be strengthened and maintained. If you’ve been together a while this may be challenging. Here are three ideas to help you strengthen and maintain that beautiful bond with your partner. Date each other regularly- A common belief is that when you’re in a long term relationship dating is no longer needed. This is not true. Dating is not just for new relationships, it's a great way to spend time together doing something enjoyable and strengthening your bond with your partner. In our busy world it’s difficult to make time to spend with just you and your partner, which is why dating is so important. Set aside time for each other on a routine basis to go on a date, preferably at least once per month. Hold this time as sacred and try your best not to reschedule because your relationship with your partner is very important. If time and/or finances are tight, think out of the box! A date does not have to cost a lot of money or take an entire evening. You and your partner can have a cook-off at home, or reminisce over coffee, or build a pillow fort in your living room. Ultimately, as long as you are spending quality time together the date activity doesn't matter. Be Silly together- The ability to cope with stressors using humor is a strong predictor of a healthy relationship. 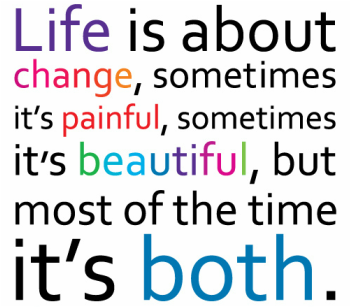 In a long term relationship we are sharing our journey through life with our partner through the hard times and the good times. Life provides plenty of hard times, so give yourself some much needed balance by creating good times by having fun and laughing with our partner. Don't be afraid to look a little silly in front of your partner, they may enjoy seeing a vulnerable/goofy side more often and if you can share a laugh together, even better! Laughing and being silly with strengthen your bond and bring you closer, especially in times of high stress when it's most needed. Hopefully this give you a few ideas to help your relationship flourish. Remember your relationship is something that needs to be maintained through time, not just something you use as needed. Try your best to be consistent and present in your relationship so you and your partner can support each other in the good and the bad. The more consist you are in spending quality time with your partner, the healthier your relationship will become. Your relationship is important, show your partner you value them and your relationship with them. If you and your partner would like more opportunities to strengthen your bond or need more support in doing so, feel free to contact me about the relationship enhancement group being offered. Click the link below to read a great article about autism in girls and women, and why it is often so difficult for clinicians to identify. So you've made the decision to go to therapy! That's amazing and congratulations for taking the first step in healing. But now you're faced with the task of finding a therapist to work with. This doesn't have to be daunting. Start with calling to interview therapists you are considering over the phone before committing and use these 3 tips to help find the best therapist for you. Save time when searching for a therapist by searching for a therapist that specializes in the specific issue you are seeking therapy for. All therapist are generally trained in most emotional and mental health issues, therefore finding one that specializes in what you are dealing with will not only save you time but guarantee that you get the best care. So when searching online or asking for referrals be sure to use keywords that relate to your problem. When interviewing therapists ask them about their speciality and make sure its a good fit for you. 2. Don't feel confined by your insurance network. It is a myth that going through your insurance plan is the only affordable way to attain therapy. Furthermore, insurance is not set up to foster the best therapy; it is designed to save the insurance companies money. There are several highly qualified therapists that offer sliding scales to their customers, making therapy very affordable. Also therapists registered as psychological assistants, are able to charge significantly reduced fees while they are working towards their licensure, giving clients the opportunity to save big bucks while receiving quality therapy. When you go in for a consultation with a therapist, ask them if they offer a sliding scale and don't hesitate to negotiate a fee that you feel is fair with therapists you interview. 3. Notice how you feel when talking with the therapist. One of key factors of success for therapy is the relationship between the therapist and the client. So follow your gut and take stock of your first impressions of each therapist you interview. It is important you feel comfortable with your new therapist and your first intuition is usually a good indicator of how you will relate with your therapist in the future. And if you are unsure about something you are sensing, I encourage you to ask the therapist questions to better clarify any preconceived concerns. I hope this helps you begin this amazing journey, and HAPPY HEALING! Also if you are looking for a supplement to therapy read Tiffany's blog about the Benefits of Meditation, to learn how to increase your happiness even further. 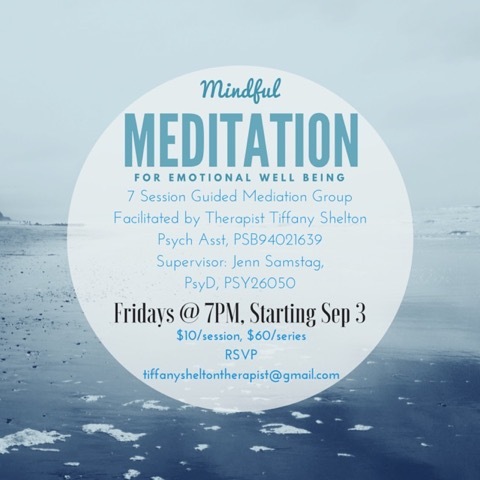 My psychological assistant, Tiffany Shelton, will be running a group focusing on mindfulness through meditation. This 7 session group is open to anyone who is seeking to enhance their emotional well-being in a supportive, safe, and inspirational group setting. Reserve your spot today! 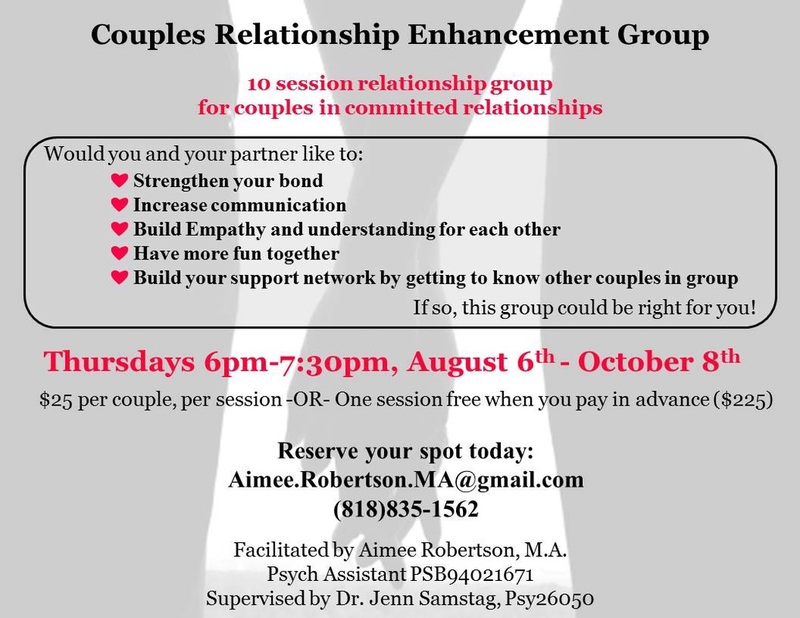 My psych assistant, Aimee Robertson, will be leading a group for couples focusing on relationship enhancement. It will be a great opportunity for couples to gain insight on their relationships and themselves, and in a safe and supportive group environment. If you are interested, or know someone who might be, please contact Aimee ASAP. Space is limited, so reserve your spot today! This is a great article about the new Pixar film &apos;Inside Out&apos;. It discusses the primary reason I thought the film was so excellent- it normalizes sadness, sends the message that ALL emotions are okay, and demonstrates the power of validating feelings. Such a great movie and wonderful tool for discussing emotions with children and adults alike!